On a sunny day last August, a few men were fishing in the river Pamba in Kozhippalam near Aranmula town in Kerala’s Pathanamthitta district. Like most villages in the area, Kozhippalam was devastated last year in the biggest floods to hit Kerala in living memory. Most houses in the village were empty, as people were scared to move back into homes that had been subsumed by the Pamba so recently. But that day, the Pamba was calm, and the floods seemed to belong to a bad dream, except for the trees lying uprooted on the river bank. Suddenly, one of the fishermen saw some terracotta figures peeking at him through the filaments of the roots. 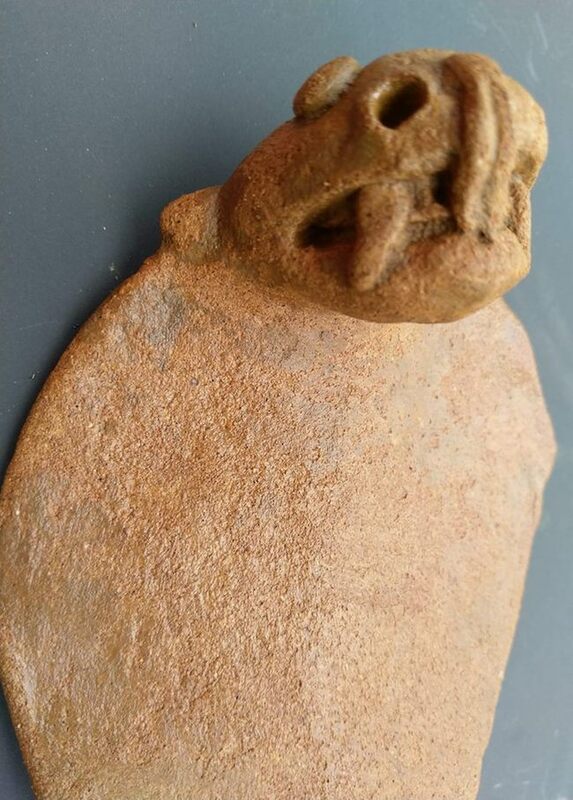 Wondering if the floods had unearthed a piece of ancient history, the fishermen informed C.N. Sukumaran, a fellow villager. And the rest, as they say, is history — quite literally in this case. Sukumaran, academics, historians and enthusiasts soon got together and approached the government. Things moved fast. 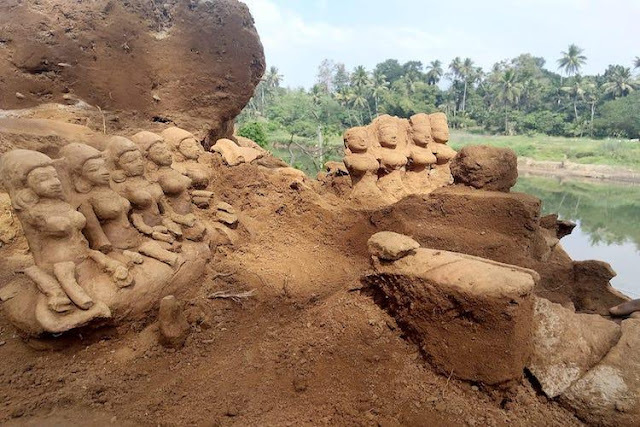 Kerala’s Department of Archaeology swung into action within a matter of weeks. What till then had been just a ‘riverfront plot’ owned by ‘someone settled in Mumbai’ suddenly became a hotbed of activity. 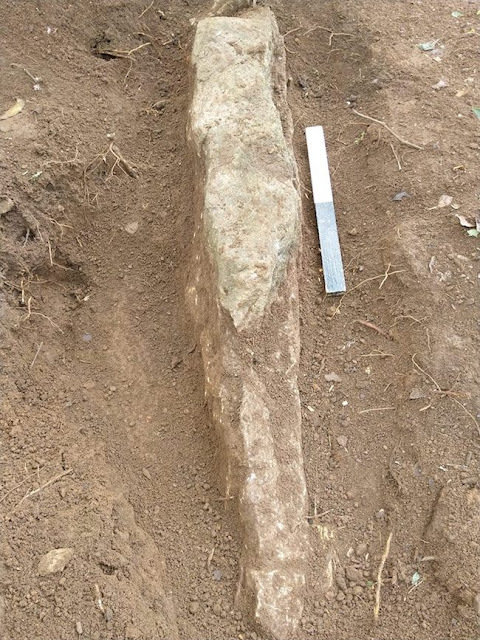 The narrow lane at Anjilimoottil Kadavu — just wide enough for our SUV to pass through — ends at a plot with a rusted gate, half open, reluctantly allowing in history enthusiasts interested in a glimpse of the excavations in the adjacent compound. The floods that had wreaked havoc a couple of months ago had pulled down the compound wall that separated these two plots, and thus made the excavation site accessible by road. Inside, the trenches baked in the heat of the sun, and the coconut palms and banana plants shone an even brighter green in contrast. The artefacts in the trenches were partially visible from the outside, but were still held tightly by the soil that had protected them for centuries. Unearthing these figurines under the hot Kerala sun is just the beginning. They also need to be cleaned of the mud they have been covered with for centuries. The fallen compound wall has now become a platform to dry the hundreds of terracotta faces, limbs, and torsos dug out so far. They will now need to slowly be joined together and brought to life, a task that could put a Ravensburger jigsaw puzzle to shame. Once put together, the pieces will hopefully become characters in a historical epic of the area. Among the artefacts discovered were idols of mother goddesses (Sapta Matrika), naga (serpent) idols, and many figures of men. Each one tells a story. In the coming months, experts will examine these and the pottery shards to understand their origin and the period they belong to. Some of them, , like the stylized naga caressing the upper half of its face with its tongue, have never before been discovered anywhere in Kerala, says K. Krishnaraj, lead archaeologist, as he gently brushes mud off the eyes of one of the faces. The site, with its trenches waiting to be excavated and its discoveries drying in the sun, is a surreal sight. A bygone era returning to life. Iconographic studies and thermoluminescence dating (TL) of the pieces are expected to tell us more about their age and the lives of people who lived here and worshipped these gods. Who were they? Were they natives or settlers? When did they live? What did they eat? Was this a holy place of worship of a lost civilisation along the Pamba? What has been discovered so far appears to be only the tip of the proverbial iceberg. Serendipity is not alien to archaeological discoveries. 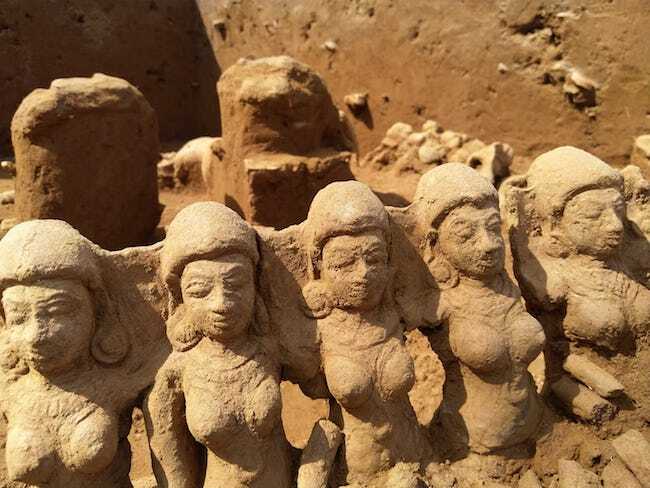 While the team was busy excavating these figurines from a couple of hundred years ago, another story was waiting to be told across the Pamba, in Vellangoor. Rajeev Puliyoor, a Malayalam teacher in the College of Teacher Education in nearby Elanthoor, brought some of his students to the Anjilimoottil Kadavu site. One student called Gopika saw the idols and said, “This is nothing. There are bigger such buried in my house.” Puliyoor, who is working closely with the excavations, immediately informed the archaeology team and they went to the student’s house. Mathesseril Gopalakrishnan Nair, Gopika’s father, runs a palm leaf plate and bowl manufacturing unit. Very matter-of-factly, he took the experts around his land and showed them the various pieces lying around. There have been long cuboidal stones, obviously manually shaped, lying about his land for as long as he can remember. His family had never bothered to discover what they were. As a teenager, Nair had tried using the stones to build the house he now lives in. Fortunately for the world, the stones were too fragile for construction. When the team revealed that the stones were part of cist burials from the Megalithic age, Nair was hugely surprised. The slabs he had treated so casually were part of 2,500-year-old graves, shaped by people adept at stone-cutting. The archaeologists believe more slabs lie under the earth. Meanwhile, Nair has more practical concerns. “I am going to wait for the compensation the government will offer before I move out,” he says. As for Aranmula, the cultural capital of what’s often called the Pamba Valley Civilisation and famous for the metal mirror and the annual boat race, it has just added one more feather to its cap. I wish they find some Brahmi script also. A wonderful find for Kerala and its' people.